In this pAsuram, mAmunigaL is following AzhwAr’s pAsurams of fully enjoying the beautiful form of azhagar emperumAn who is residing in thirumalai (thirumAlirunjOlai) and is mercifully explaining it. He became blissful and revealed his overwhelming emotions in thiruvAimozhi 3.1 “mudichchOdhiyAy“; mAmunigaL mercifully explains this starting with “mudiyAr thirumalaiyil“. 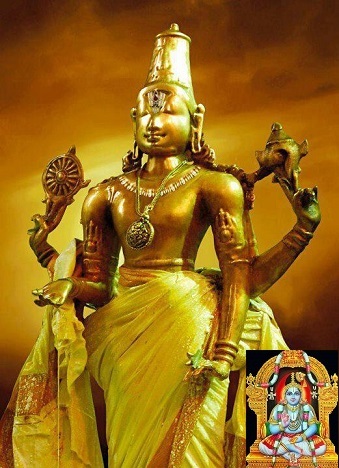 Previously, AzhwAr firmly remained and enjoyed the thirumalai which is having peaks and fully enjoyed the beauty of azhagar emperumAn‘s divine form, along with his crown, anklet and other ornaments on his divine form. mudiyAr thirumalaiyil mUNdu ninRa mARan – As said in “virAjathE vrushAthrEScha Sikaram dhaSadhAthubhi: | bhUshithO bhUpathiriva kirItE nArkavarchasA ||“, with abundant peaks which resemble the tall crown of the supreme lord as said in thiruviruththam 50 “viNmudhal nAyagan nILmudiyOdoththa” (resembling white pearl garland decorating the divine crown of paramapadhanAthan) and in thiruvAimozhi 2.10.2 “madhi thavazh kudumi” (the peak where moon crawls), and in periyAzhwAr thirumozhi 4.3.10 “Ayiram paindhalai ananthan” (well-spread, thousand hooded serpent, AdhiSEsha), AzhwAr remained firm and enjoyed the thirumalaiyAzhwAr (the divine hill). mudiyum adiyum padigalanum muRRum anubaviththAn mun – mAmunigaL is mercifully following the words of AzhwAr in “mudichchOdhiyAy unadhu mugachchOdhi malarndhadhuvO adichchOdhi nI ninRa thAmaraiyAy alarndhadhuvO padichchOdhi Adaiyodum palakalanAy nin paim pon kadicchOdhi kalandhadhuvO thirumAlE katturaiyE” (Did the radiance of your divine face rise upwards to become the radiance in your divine crown? Did the radiance of your divine feet spread downwards to become the radiance in the lotus flower where you stand? Did the radiance of your well spread beautiful waist spread downwards and upwards with the naturally radiant cloth and the divine ornaments you wear? Since you are the lord of SrI mahAlakshmi, as said in SrIvishNu purANam 1.8.18 “arthO vishNuriyam vANi” (SrI vishNu is the meaning and SrI mahAlakshmi is the word), as you are the one who are the controller of words and meanings, mercifully explain this to remove my doubts) [1st pAsuram], which highlights emperumAn‘s inconceivable form. It is said in SrI rAmAyaNam AraNya kaNdam 1.1 “rUpam samhananam lakshmIm” (his form, beauty and tenderness). mudiyum adiyum – He enjoyed starting from the crown and down to the anklet. padigalanum – The ornaments which are present on his form in between the crown and anklet; alternatively – it is saying the ornaments which are matching well on his form. Just as a waterfalls [from the crown] will split into various floods and lead to the river [waist]. In this manner, being the wavy ocean of beauty which engages the mind. muRRum anubaviththAn mun – It is saying “AzhwAr fully enjoyed it previously”, or saying “he [AzhwAr] first enjoyed him [emperumAn] fully”. muRRum indicates all that is said in the “mudichchOdhi” [1st] pAsuram; further, the various other references [in subsequent pAsurams] which mercifully explain the first pAsuram such as “katturaikkil – sutturaiththa nan pon un thirumEni oLi ovvAdhu” (when clearly said – the best molten gold that is prepared does not compare to the collective radiance of your divine form) [2nd pAsuram], “paranjOdhi” (supreme radiance) [3rd pAsuram], “nin mAttAya malar puraiyum thiru uruvam” (your tender flower-like divine form) [4th pAsuram], “malar kadhirin sudar udambAy” (radiant light with blossomed rays as his form) [5th pAsuram], “pOdhuvAzh punandhuzhAy mudiyinAy! pUvinmEl mAdhuvAzh mArbinAy!” (Oh one who is having the divine chest which is the eternal abode of SrI mahAlakshmi, who was eternally residing in the lotus flower!) [6th pAsuram], “mAsUNAch chudar udambAy” (Oh one who has a divine form which is devoid of any blemishes) [8th pAsuram], “un sudarch chOdhi” (your radiant lustre like form) [9th pAsuram]. This entry was posted in Other, thiruvAimozhi nURRandhAdhi on December 18, 2018 by Sarathy Thothathri.